As I promised a couple of days ago I said I would post some more of my son’s album that I have been completing but out of respect for the people in Boston I decided to leave it yesterday. All my thoughts are with those affected by this tragedy. Even though I live in New Zealand these events still have quite an impact on us. I am really loving using the Border Maker system and the cartridges. 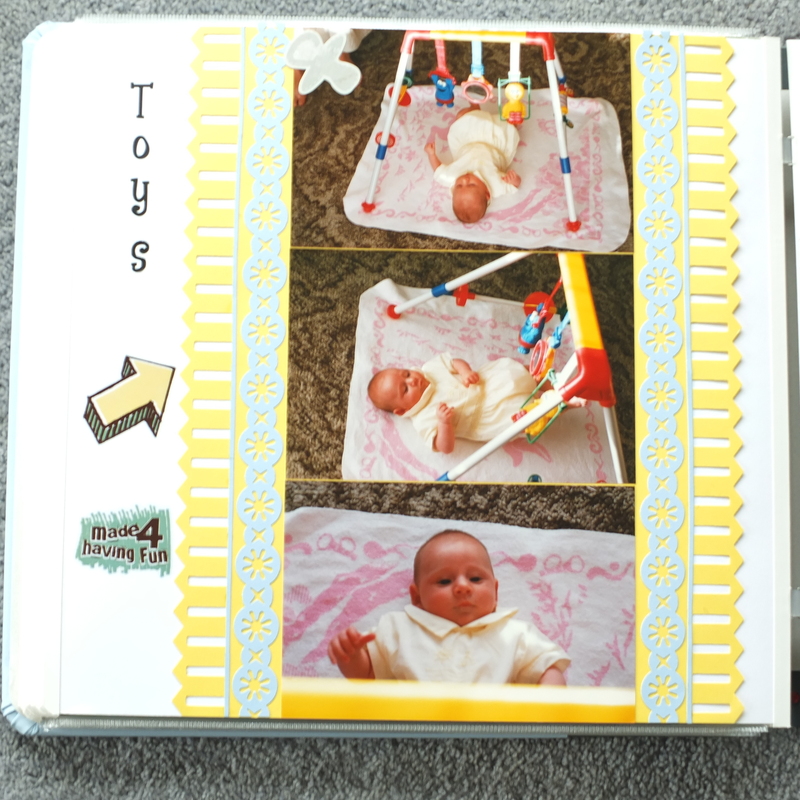 In this page I have used the picket fence and twinkle chain border and as you can see I do not throw anything away. I have used the thin strip of card left over from using the twinkle chain cartridge to glue a thin strip of card down the edge of the picket fence. The yellow has worked beautifully with the outfit that James is wearing as well as the play gym he is playing with. The blank pages I use are a great background without using a lot of cardstock or paper which can be cost effective and allow the packs to last a lot longer. I have used the sentiments from the Rugged range as well as I can’t seem to have blank spaces somehow!?! I am working on this all the time and I will get better. Tears for all the people in Boston at the moment. what a talented lady, craft work and photography, all in the top range of her craft, have fun opening this site, as you never know what you will find in there, very pleasing work, thanks Patricia,love your craft. marion of upper hutt. Your cards are pretty spectacular too.